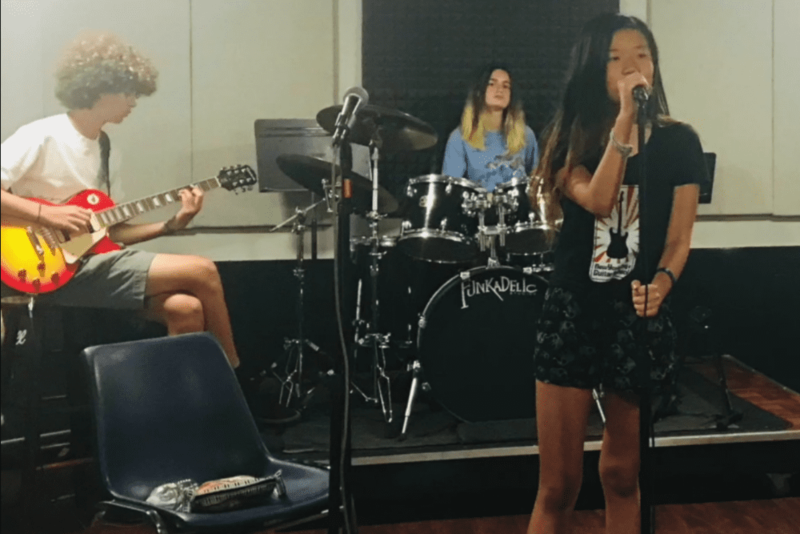 Learn, make music and make friends in Beginner Guitar Boot Camp or School Break Rock Band. Expert coaches and effective small groups. Collaborate to make music and friends. We make school breaks fun and productive with small group guitar classes and rock bands, with fun electives and a show! Kids go back to school with new friends, new experiences and new skills. 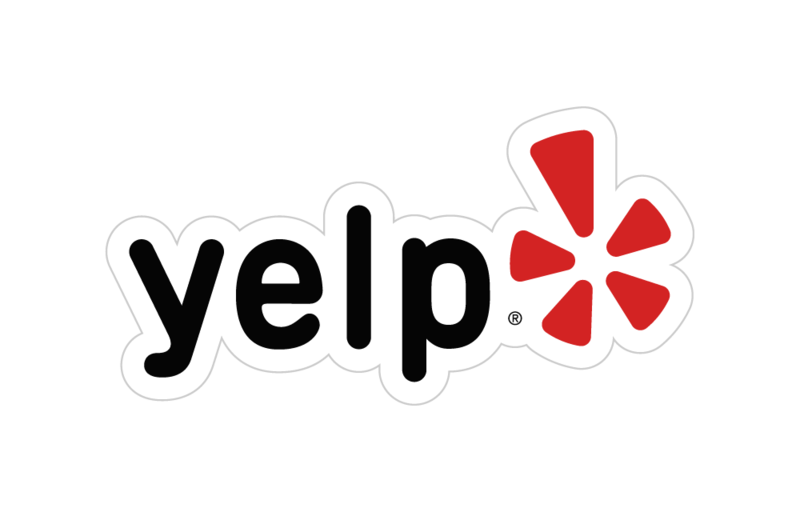 In fact, we've been given over 100 five-star reviews on Yelp and Google. Located in the iconic Music Building, 39th Street / 8th Avenue and at Funkadelic Studios, 40th Stree / 7th Ave.
9:45am-4:15pm includes guitar class or band rehearsal plus songwriting and digital music electives. Early drop-off and extended day are available! Instruments are available, too! Tuition is only $475 for 5 day camp, $285 for 3 day camp. Additional discounts for returning students and siblings. Workshop and Q & A with Maddie Rice, lead guitarist on The Late Show with Stephen Colbert (and ex-NYC Guitar School Teacher). Included in the Spring Rock Camp experience for all ages and levels. Warm, positive and hard working! 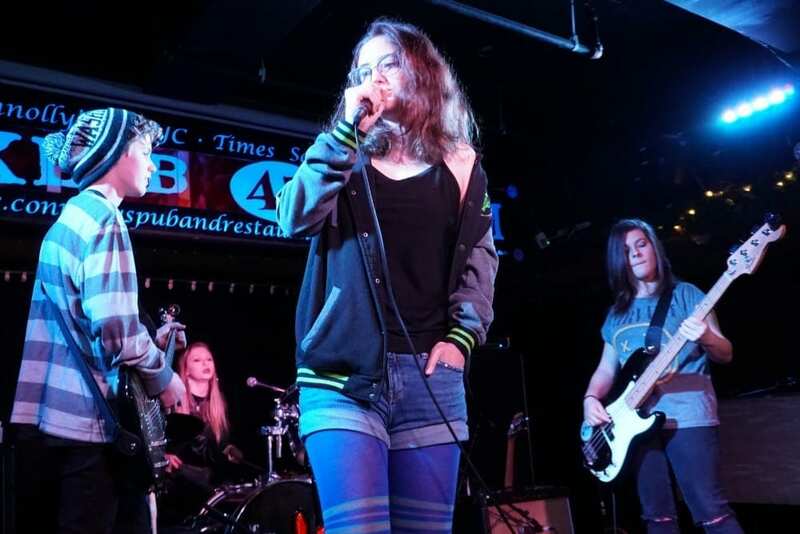 Whether kids and teens are honing their skills in class, cheering on the other bands, or taking advantage of open mics and band showcases, they will be surrounded by positive people who are growing as musicians and as people. Does this sound like it might be the right place for you and your family? Then...it probably is! What school break sessions do you offer in the 2018-19 school year? Three camps for ages 8-14. Beginners learn in Guitar Boot Camp, and continuing players sing or play guitar, drums, bass or keys in a Rock Band. All camps run Mon-Fri 10am-4pm with a 5pm show on final day.! Three Day Winter Break Camp December 26-28, 2018. One Week Mid-Winter Break Camp February 18-22, 2019. One Week Spring Break Camp April 22-26, 2019. <1-- What if I'm above age 14 and want to rock, or if I need other dates, or if I have a group of friends who want to do a band together? We aim to please, and we also put together custom groups. Email us for more info. --> What is the difference between Boot Camp and Rock Band? Rock Band is for kids who already play guitar, bass, drums, keys or sing! 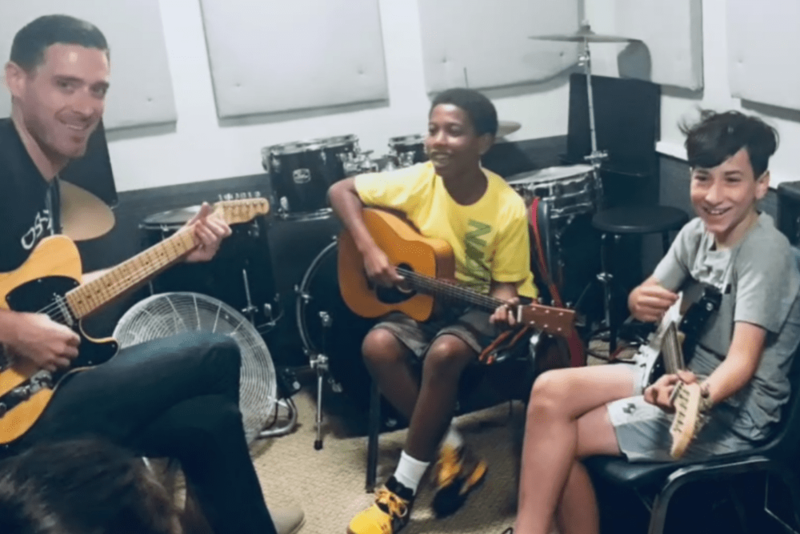 They'll be immersed in music each day, rehearsing with their band, and also learning to create their own music on a computer and write songs. On the final day, Rock Bands play a show for friends and family. If you kid is super advanced, great! We have an incredible community of young musicians who are serious about music, rehearse intensely, and perform at a high level. But even if they can play at least a few open chords with confidence and play at least one song all the way through without stopping, you should still sign them up for Rock Band. Whatever their level, we will put them in a group that is right for them! School Break Boot Camp is for kids who don't yet know how to play guitar. By the end of the week they'll know the basics of chords, strums and reading tablature and will even take the stage on the final day to play a song along with your classmates. You'll also learn the basics of digital music and songwriting. Guitars are provided at no charge for Boot Camp students! If your camper is a total beginner, sign up for Boot Camp. **EARLY DROP-OFF available at 8:45am for $8 per day. EXTENDED DAY BOOSTER LESSONS are available after camp for $30 per day. **On the final day, campers stay for snacks and soundchecks before the 5pm show. What should students bring to camp? Acoustic guitars are provided for boot camp students. Band students, please bring your own electric guitar or bass, cable, strap and tuner. (A limited number of electric guitars and basses are available for rent when you fill out the registration form.) Drummers, just bring your sticks. Keyboards and vocalists, just bring your rock and roll self. Please also bring your own laptop or tablet (Mac/Apple/iPad preloaded with Garage Band preferred.). Your digital sessions will be saved onto your own computer. Laptops will be used from 2pm to 4pm, and will be securely locked up when not in use. Oh, and bring a pack lunch! Tell me more about the workshop with Maddie Rice! We are excited to announce that Maddie will be visiting the Spring Break Rock Camp students on Tuesday April 23rd at 2pm for a workshop/Q&A. 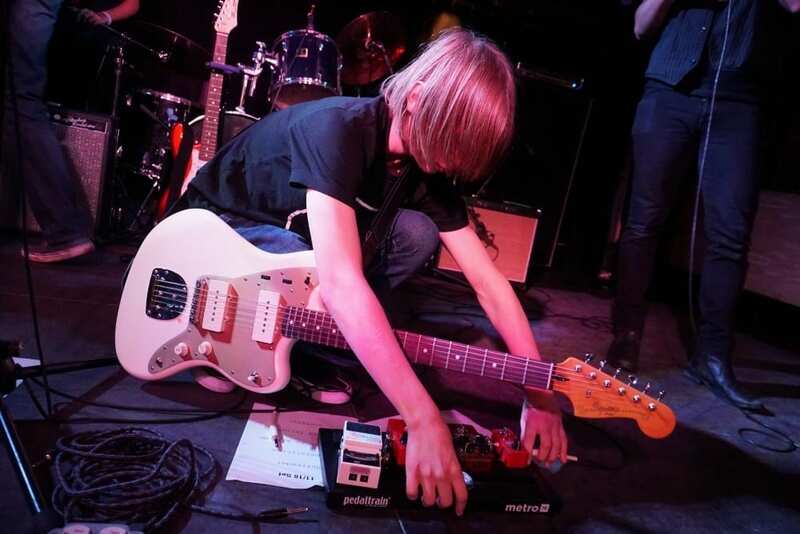 Maddie Rice is a New York City guitarist, singer and songwriter (and a former NYC Guitar School teacher). She honed her skills at the Berklee College of Music and recording and touring the world with artists such as art-rock band Rubblebucket, K-Pop star Taeyang, and many more. She currently plays in the house band on the Late Show with Stephen Colbert and taught herself Korean in her spare time! She has an incredible work ethic and great insight into what it takes to become a professional guitarist. She is also simply an inspiring person to learn from. A few of our more advanced camp students will get even get the opportunity to have a short jam with her! Where are school break camps held? The Camps are held in Funkadelic Studios and in the NYCGS Rock Rooms in the iconic Music Building at 584 8th Avenue in Midtown Manhattan. Funkadelic Studios is a professional rehearsal studio used by working NYC musicians for over 25 years. The Music Building has been a rehearsal home to artists such as Madonna, Metallica, The Strokes, Parliament, David Byrne, Interpol, Patti Smith, Joey Ramone, Billy Idol, The New York Dolls, Lou Reed (and many more!). Each camper gets a NYC Guitar School T-Shirt. Nice! CREATE YOUR OWN CAMP. Put together a group of four or more campers and we'll create a custom camp on the dates that work best for you! Email us for more info. QUESTIONS? We want to know! Contact us at camps@nycguitarschool.com.